Hold two cameras comfortably at your hips, and one by your chest with this small Money Maker Three-Camera Harness with Black Hardware by HoldFast Gear made of tan English Bridle leather. For comfortable wear and shooting, the straps of the harness lie in an "X" pattern across your back for added support. The Speed Clutch mechanism allows the camera to slide along the harness to eye level easily. To secure your gear to the harness, the system includes two Camera Holdfast Accessory Clips that screw into the 1/4-20" tripod threads of each camera or lens. There are also two metal D-rings on the front of each strap, and two on the back, that allow you to attach optional camera straps and accessories, such as an HF Luggage Tag Wallet or extra Camera Leashes. If you attach optional Camera Leashes to the front D-rings, you can comfortably secure a third camera to the harness. The small size is your best fit if you are 5'7 or shorter. The Money Maker Three-Camera Harness is made in the USA and backed by a lifetime warranty against manufacturer's defects. Designed to hold a camera on the left and right side of your body at hip level. A third camera can be attached to the harness by snapping the included Camera Leashes into the D-rings on the front of the harness. Speed Clutch mechanism allows you to slide each camera smoothly from your side, up to eye level to shoot. Includes two Camera Holdfast Accessory Clips that screw into the 1/4-20" tripod threads of your cameras. Six metal D-rings permit you to attach accessories. English Bridle leather is made in a process where only the best grades of leather are stuffed with grease and finished with wax. One side has a smooth, flesh texture and the other has a grainy texture. 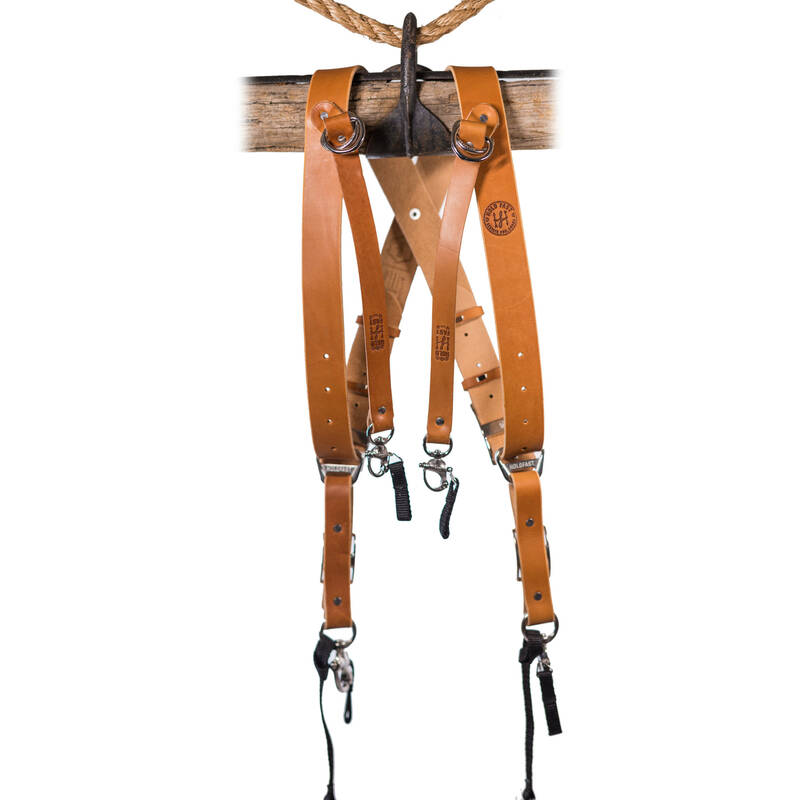 Box Dimensions (LxWxH) 9.1 x 2.5 x 0.2"
Money Maker Three-Camera Harness with Black Hardware (English Bridle, Tan, Small) is rated 5.0 out of 5 by 2. Rated 5 out of 5 by Donna from This Money Maker could be your money maker... It took a minute to figure out which way was up, but once I got through that, I was very pleased. Heavy duty sturdy leather. Comfortable fit. You can feel confident that you aren't going to loose your gear, it's on there very securely; with a tether included for good measure...No more lugging around gear bags for me. I bought the harness for three cameras but immediately realized I'd never go that route. If you buy the set built for 3, you can always use the front piece to hang a small clip on bag...I'm very happy I bought this, it's really such a time saver and a space saver as well. Rated 5 out of 5 by roth7740 from Absolutely love it. A must for Hybrid shooters The single most good-looking, professional, versatile camera strap system I have ever had. It really takes the weight off your neck and my back has never felt so amazing after a long day shooting a wedding. Highly recommend this system!